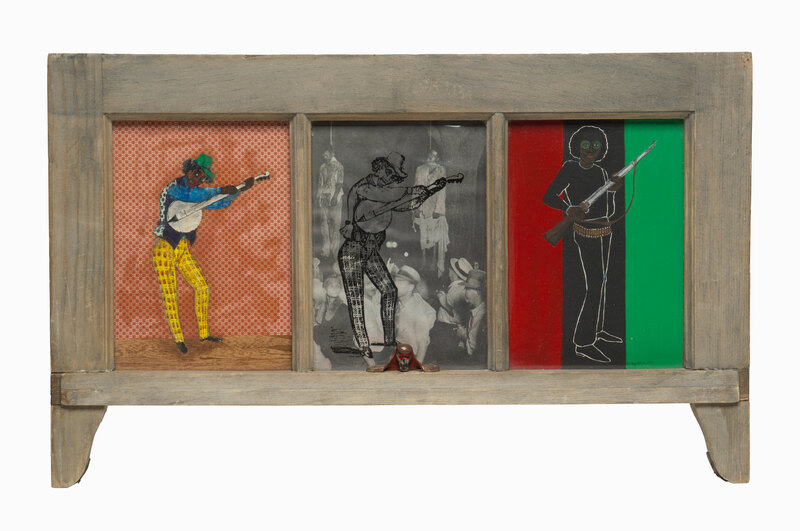 In this mixed-media triptych Saar addresses the role of African Americans in entertainment. In the first panel, a stereotypical black minstrel is depicted playing a banjo. Minstrel shows were a form of entertainment that ridiculed and stereotyped African Americans, often portraying them as silly, lazy, and ignorant. The second panel portrays the minstrel again, but this time the image overlays a violent lynching scene. The final panel depicts an African American activist holding a rifle, with the Black Nationalist colors of red, black, and green behind him. With Let Me Entertain You, Saar asks the audience to consider the alternative roles that African Americans adopted—like the minstrel—as less overt but equally resistant methods of survival. "Let Me Entertain You." Now Dig This! Art in Black Los Angeles, 1960–1980 Digital Archive. Los Angeles: Hammer Museum, 2016. https://hammer.ucla.edu/now-dig-this/art/let-me-entertain-you.